I thought this article was well organized, easy to follow, and incredibly funny. I like how the author not only uses satirically describes the different types of bikers, but the way he describes them is incredibly on point. I automatically had the picture of the urban cyclist in my head when describing them as pretentious or that they use bikes because its a trendy way of getting around. The author was trying to make fun of the bikers in a not so subtle way, but he was also being serious that there are so many people that fit into these categories. I also thought it was funny there were specific types of people who disliked each category, as if their quirks annoyances didn’t annoy every type of person. I feel like each category of biker secretly hates at least one of the other kinds of bikers. For example, I think the Urban biker secretly hates the lone wolf because he lacks a sense of fashion when riding a bike and has a different kind of coolness. 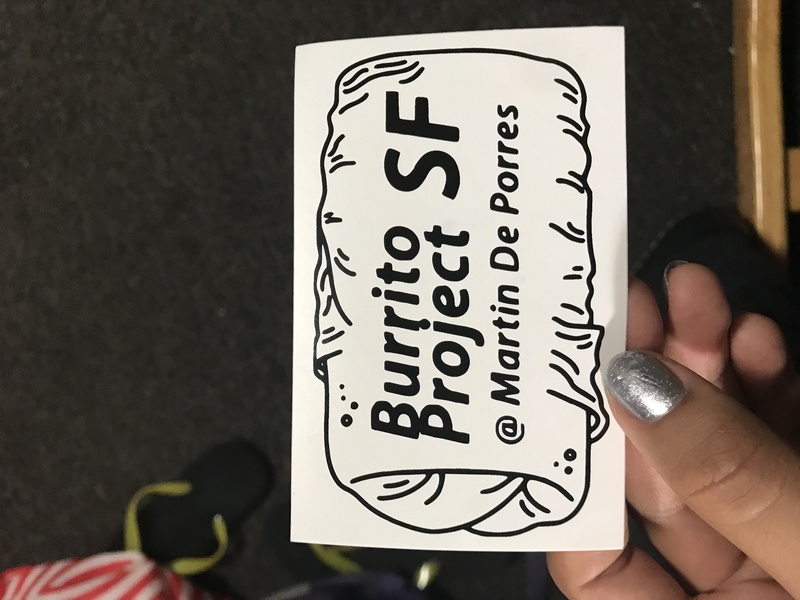 Tonight, I spent about two hours prepping and building burritos for the homeless at the Burrito Project SF @ Martin De Porres. At first I was really skeptical because the address was a somewhat sketchy warehouse, but the kitchen was really fun and festive when I was lead in. My first job was to unfold over 500 pieces of tin foil which would be used to wrap the burritos. After this process, we were each assigned a station in a uniform fashion. Some cooked tortillas, other cooked rice and beans, and some wrapped burritos. 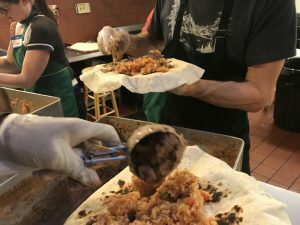 I was one of the two people who scooped salsa into the burritos, and even had the chance to wrap a few. I met some very interesting and incredible people. One was dubbed the Duchess of San Francisco and was a coordinator for a non-profit that accumulated a portion of its profits through drag shows. Another woman had lived only 20 minutes away from my hometown and moved to San Francisco to be with her mother. 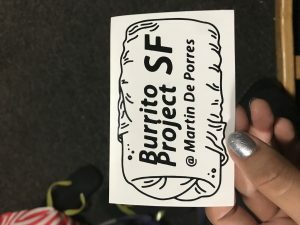 What I found the most interesting was that the Burrito Project fund was based solely off of donations, but only one dollar would make a burrito and a half. 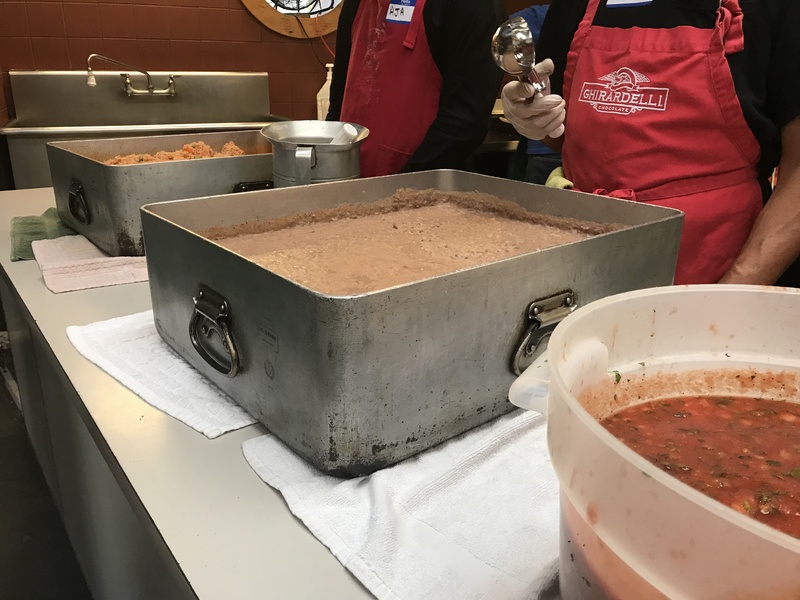 Overall, this was a great experience and I would love to volunteer here again. 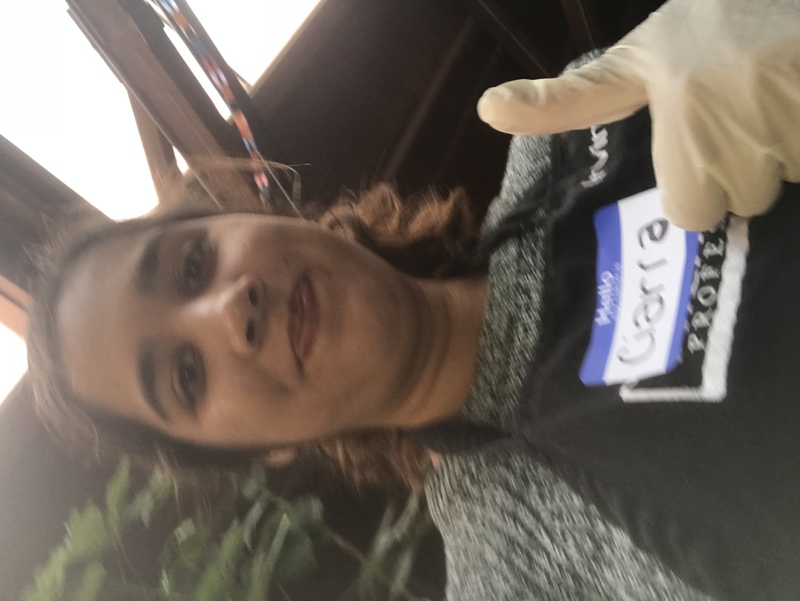 I want to reach out to the younger generations between the ages of 13 and 30 because I feel they are more open minded and willing to take in new ideas. I want to enlighten them with new ideas and thoughts in hopes of having them change the world with a new perspective. Even if they don’t completely agree with my ideas or opinions, they are still able to form their own variation of opinions on the topic I had presented. Mark was probably one of the best speakers we have had in this class. He was incredibly insightful and offered a lot of useful information. The thing that stuck with me most would have to be his advice on working with or starting up a new company. He recommended that we work for a place that relates to our passions and interests. We will do the best work there. He also stated that starting up a company takes times. We should continue to work on our projects for months or years, and then expect to see results. If we continue to push our ideas and work out the kinks, the dream will soon become a reality. I also like his mindset on interacting with businessmen and potential clients. We shouldn’t judge a person’s intelligence or honesty based on their attire. He was very open minded to all people, he was honest in his speaking, and overall very knowledgeable about this product. As for the presentations, I was impressed with what people had to say about the article. Olivia, Aaron, and Remi stated that you must be thoughtful of your audience and consider their ideas. This could potentially make them more interested in your ideas since they believe you are interested in theirs. Mark also reiterated this, saying that gaining trust in your audience is an important part of the networking world. I thought everyone did a great job on their speeches and presentations today! The different points of view were really cool and the topics people chose were really interesting! I really liked how some people reused some of the topics they used for speech one and incorporated new ideas and points of view! I think Jordan was one of the speakers who did this and I really appreciated how her theme stayed consistent for both speeches, but her ideas were fresh and new! I also thoroughly enjoyed how Aaron focused on more psychological aspects in his speech. It was very interesting, he was incredibly knowledgeable about the topic, and provided a wide range of evidence to back up his statements. He was seemed very comfortable speaking in front of an audience and had a relaxed stage presence. I was glad that my speech was smooth and informative, but I was somewhat disappointed in my presentation. I tried to come up with a strong hook and closing, but the transitions into them were choppier than I wanted them to be. This is because I added more content during my speech than I had originally intended which messed with the fluidity. Although less smooth than intended, I was glad that I had a stronger conclusion than my first speech. I also felt that my hook grabbed the attention of my audience better than hook of my first speech. I felt more confident giving this speech and felt that my tone of voice was more appealing and upbeat than usual, which I was really glad about. The way I wrote out my speech was also far more efficient than the way I wrote out my speech the first time. For my first speech, I wrote the entire thing in paragraph form which made it very difficult to follow along with. For my second speech, I used bullet points which allowed me to read it faster and speak more efficient. I was overall very happy with performance and hope to improve for my next speech. My rehearsals for speech two went much smoother than the rehearsals for speech one. I was much less invested in making sure I was able to record my videos word for word and instead focused on my content. I recorded my first video right after I finished writing my speech. Before I pressed record, I made sure to read over the entirety of the speech to make sure I phrased everything correctly and knew what I was going to be talking about. I then set my phone up against my laptop and red the speech. I tried not to read it word for word since I would not be presenting it like this for my actual speech. I would read the opening sentence, speak from memory, and then recite the quotes. I did not rehearse the other two speeches until the next day because I wanted to reread my work and change any other small mistakes. When recording my next two videos, I changed the wording of some sentences which made the speech less smooth, but it was decent overall. For this speech, I compared two different articles trying to sell food bikes to the general public. One article was written by the Icicle Tricycle, a company that designs and manufactures food bikes to vendors. The other was written by National Public Radio on how food bikes are the newest and most efficient way to buy food. Although they both discussed the same topic and wrote with the same positive vibe, both displayed the food bike in a different way. The creators of the Icicle Tricycle mentioned many positive aspects of the food bike, but they let the pictures of the product do all of the talking. They brought up major points, such as its cost effectiveness and ecofriendly traits, but they failed to use stats and quotes from happy customers to sell their product. The National Public Radio incorporated more physical evidence, like statistics, more than a dozen quotes from customs, and pictures taken by the authors themselves. They were both very informative and easy to work with and they each offered a variety of information. My first conference with Professor Hunt was actually very helpful. I remember being very indecisive as to what I wanted to write about, whether it be about health in relation to bicycles or biking in a specific location. I finally decided to write about biking in the Netherlands and how it is a big aspect of Dutch culture. I was unsure of what I exactly had to write about, but speaking with the professor at the meeting clarified what I was suppose to write on, how I was suppose to write it, and what he was looking for. I originally was just going to compare the video’s facts with my own personal experiences, but I found out I was specifically looking for whether or not the video was credible. I was able to sit down and better plan out my essay and accurately structure it. For project one, I only used a youtube video created by the popular channel How to Survive the Dutch and my own personal experiences. The theme of my speech was bike culture in the Netherlands and I had to prove as to whether or not the video accurately depicted it. I used my personal experiences, although somewhat limited, to prove that the video was credible. Unfortunately, the two did not go hand in hand and the video was proved not credible. This was not only because our experiences differed, the video was overall very satirical and failed to show where it received its facts. I had spent about an hour looking for the video that best displayed bike culture in the Netherlands, and unfortunately many of them only focused on the historical aspect instead of the physical. I was quite pleased when I stumbled upon this video, only to find it was completely satirical and criticized the Dutch and American tourists.